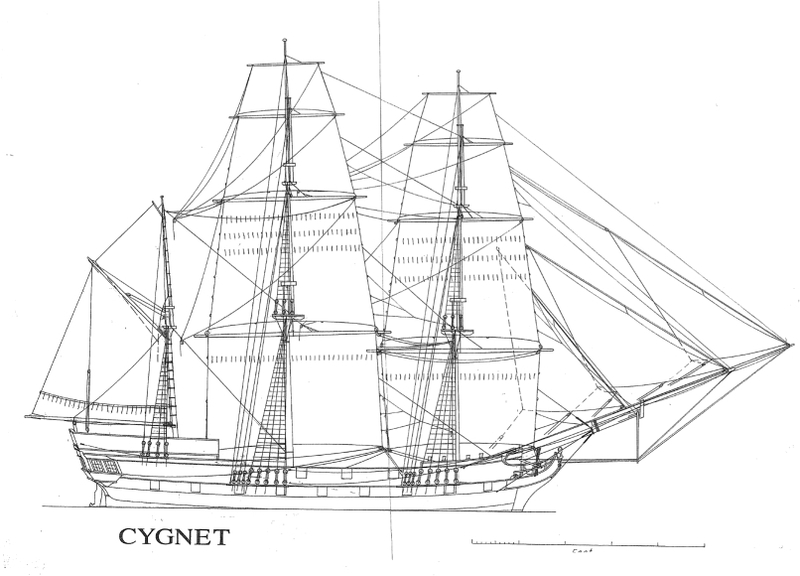 The Cygnet was built of teak in India in 1827. On its first voyage the Cygnet sailed from Calcutta to Singapore and Batavia (now named Jakarta). It traded to Madras and Bombay and then on to London under the command of Captain Morce in 1829. Thomas Ward, a prominent ship owner, bought the Cygnet, re-registered it in London and soon appointed John Rolls as master. The ship made two earlier voyages to Australia, to the Swan River in Western Australia and to Van Diemen’s Land (Tasmania). 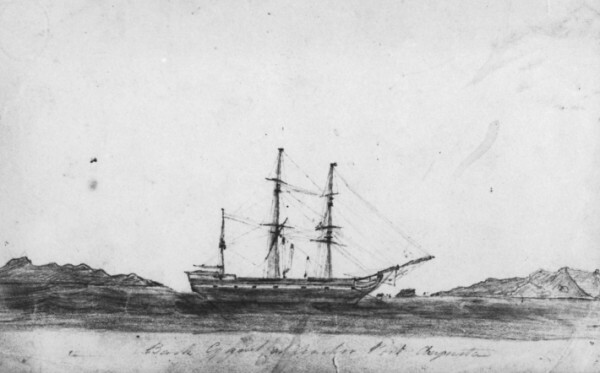 Sketch of Cygnet at anchorage, Port Augusta 1833. Image courtesy State Library of Western Australia MN 586 ACC 303A/21. 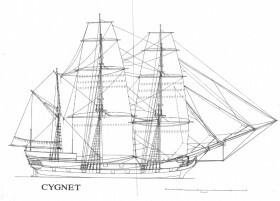 The Colonization Commissioners chartered the Cygnet to sail for South Australia in 1836 to carry many of the survey staff as well as emigrants. The Cygnet was 27.7 metres long. 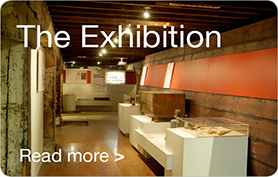 The emigrants’ accommodation was in the between-decks. That was the area below the main deck where third class passengers sailed. They were housed in dormitory style accommodation and ate and slept in the same shared quarters. The height between decks was 1.8 metres but that height was interrupted by the timber beams that supported the upper deck. They were 30 centimetres wide and reduced the height for passengers to 1.5 metres. The Cygnet did offer more comfortable accommodation for those who could pay a higher price. Pictures of the ship show a poop with passenger cabins above the main deck at the back of the ship. Those cabins offered access to fresh air, natural light and a measure of privacy. There were also cabins in the between-decks for intermediate passengers. They offered more privacy than third class but lacked the comfort of being above the deck. The crew was no doubt housed in the forecastle, quarters built above the deck toward the front of the ship. They shared dormitory accommodation but enjoyed the air and light above deck. On 20 March the passengers embarked at London’s Shadwell Basin and the Cygnet was immediately towed down the River Thames to Gravesend. It set sail on 24 March, the third vessel to leave for South Australia. Reconstructed plans of the Cygnet courtesy of Bob Sexton, 2011. Originally rigged as a ship but converted to a barque before its voyage to South Australia.